“Positive thinking” is a somewhat tricky issue for Yoga philosophy. Yoga is based on determinedly seeing things as they really are–”pure awareness” and all that. But the simple truth of the universe, according to Yoga, is so wondrous that Yoga philosophy can look like a massive dose of “positive thinking” to the casual observer. Most positive thinking is actually seeing truth that’s hidden, or it is just creative imagining. Those kinds of positive thinking are completely in sync with Yoga. On the other hand, any “positive thinking” that is a distortion of reality is counter to Yoga and unhealthy. As an example, I might improve my tennis game by imagining I’m Roger Federer. (Imagination is not untruth!) But I’m in deep trouble if I start thinking I really am Roger Federer. Simply put, the truth is pure Yoga. Any kind of self-deception is the antithesis of Yoga. I would define “self-deception” as simply anything you believe that is, in reality, untrue, particularly things you believe about yourself. A simple example―”I’m not good enough to write this essay”, or, more seriously, “I’m not worthy of being loved”. In self-deception like this, positively thinking yourself out of these falsehoods is simply recognizing the truth, and good for you. On the other hand, positively thinking you can jump off a tall building and fly is definitely not good for you. Most examples are not so easy, of course. But figuring out which are which goes to the heart of mental and Yogic health. 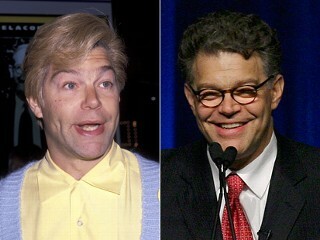 Getting back to Al Franken, the truth is that he probably is good enough. He probably really is smart enough. And doggone it, people probably really do like him. So I think his positive thinking, while hilarious, is both healthy and Yogic! Love your blog, Bob! Would you mind if I shared a few choice bites with my yoga students? I like to share a contemplation at the end of class, and I think they would appreciate the humor in your wisdom. Hi, Jody. You’re very welcome to use whatever you like. Thanks.